Have you ever heard of the saying "Keep It Simple, Stupid" or "Keep it Short and Simple", or just plain "KISS" for short? The phrase and acronym are typically used in reference to a design principal, which, according to Wikipedia, "states that design simplicity should be a key goal and unnecessary complexity avoided." Well, the Wall Street Journal reported last week on a boat whose name certainly adheres to the KISS principal. According to the WSJ, "The boat's only identifying marker was a single letter emblazoned on the stern: "A." The article states that the boat's formal name is "Motor Yacht A", named for the first initial of its owner. Personally, I love the idea of a single letter for a boat name. It's clean, easy to remember, and to the point. 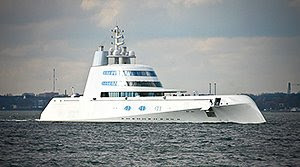 It has an air of elegance (besides the fact that it is emblazoned on a 500 foot yacht), like a monogrammed towel. The only problem is that if the convention catches on in the recreational boating and yachting community, there will be more boats named "A", "J" and "M" than there are boats named "AquaHolic" and "Second Wind". My suggestion is "Tjodhild", thats the name of the wife of the famous viking Erik the Red. She must have been one of the first females to cross the atlantic, and one of the first to send family from Europe to North america. So i suggest that they name it after one fierce and stubborn woman, who crossed the atlantic in a very basic way, more than a thousand years ago.